“To my life” or “à ma vie” was Anne of Brittany’s motto. This early Renaissance queen didn’t lack for confidence. Born to rule Brittany, she was not raised to attract the attention of a king so that she might become queen consort one day, if she was lucky. Already she was born to rule her country, the Duchy of Brittany, to the west of and independent from France. 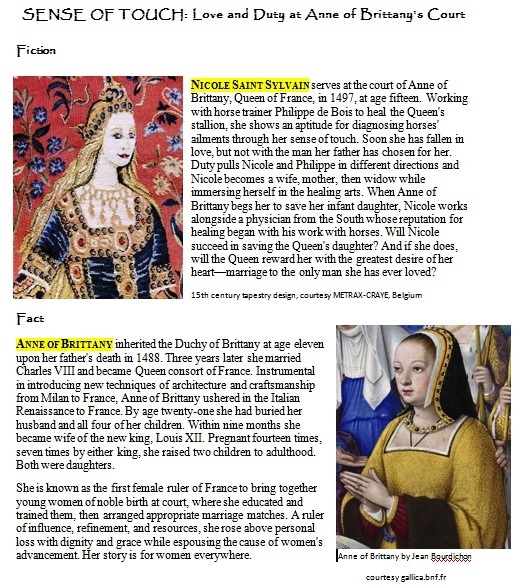 This changed everything for Anne of Brittany AND for the way queens were viewed in France. 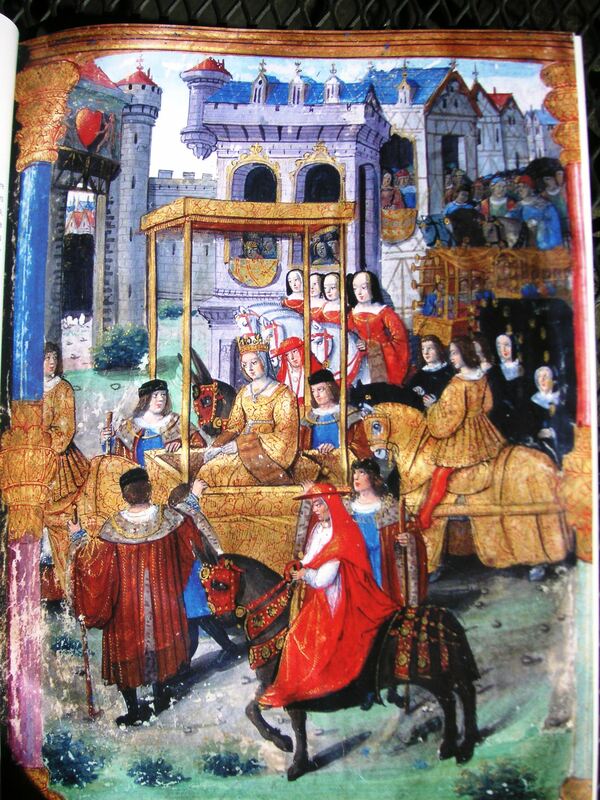 When Anne of Brittany married Charles VIII of France she came to France as ruler of her own country. 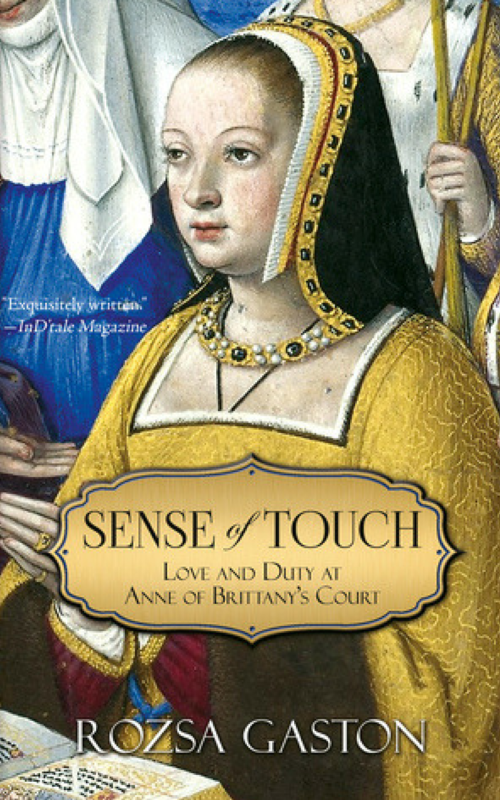 Vote here to nominate Sense of Touch for publication by Kindle Press. Campaign closes October 19 and I’ll let you know soon after if it was selected. Let me know you voted, readers and friends, so that I may add you to my acknowledgments page. You will have been a part of helping me bring this remarkable French queen’s story to life. Sense of Touch is coming soon. 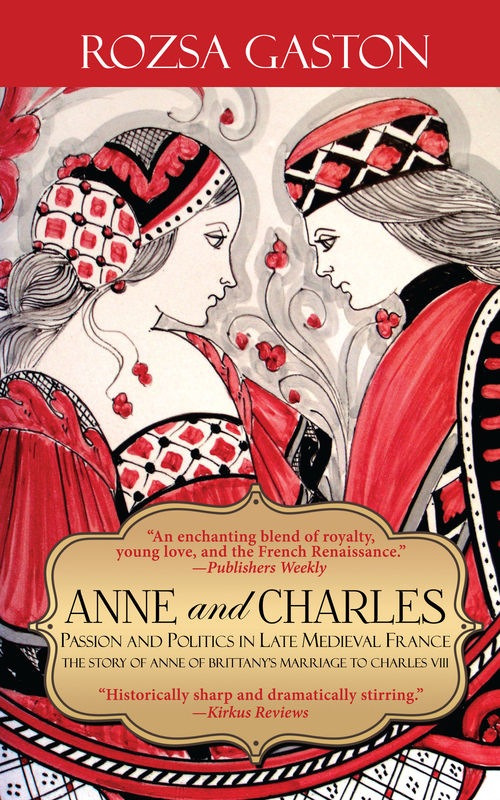 My seventh and latest novel is based on the life of Anne of Brittany, twice Queen of France. Her dates? 1477-1514. 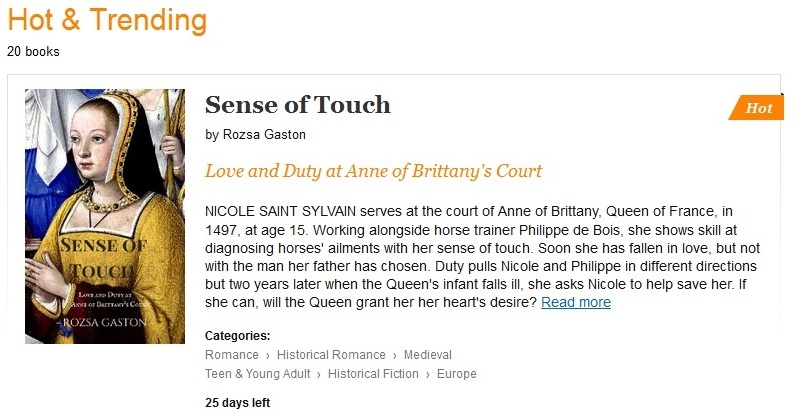 Sense of Touch has been chosen by Kindle Scout for a 30-day pilot program to see if readers get interested in this story. If the book receives enough nominations by Oct. 19, 2015, it will be chosen for publication by Kindle Press. That’s a very big deal. Why? Worldwide distribution. Here’s the link to nominate Sense of Touch for publication. It’s free, and if Sense of Touch gets picked up for publication, you will receive a complimentary advance copy. I will include your name on my acknowledgments page if you let me know you voted. Thank you. 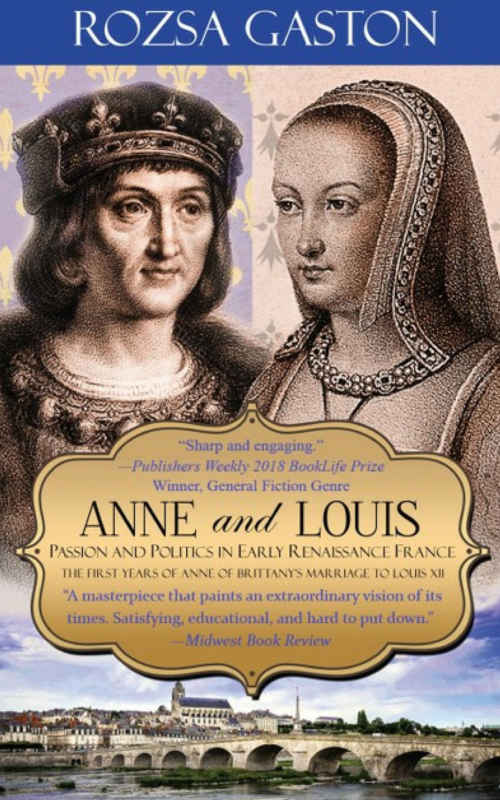 Why am I excited about Anne of Brittany? This remarkable woman, Duchess of Brittany in her own right, and twice Queen of France due to marrying well, lived exactly at the convergence of the Middle Ages with the Renaissance. What does that mean? Quick answer: Goodbye, Middle Ages. Hello, Renaissance. To put it in a nutshell, it means goodbye to collective identity and hello to self-identity. My writing platform is all about self-identity, as in how do women achieve their own? Then, how do they hone it through the years as professional and family obligations conspire to obliterate their special je ne sais quoi? Anne of Brittany did a great job of maintaining her own sense of self. Her motto? A ma vie, to my life. It takes a confident woman to have a motto like that. Here’s the gist of Sense of Touch. NICOLE SAINT SYLVAIN serves at the court of Anne of Brittany, Queen of France, in 1497, at age fifteen. Working with horse trainer Philippe de Bois to heal the Queen’s stallion, she shows an aptitude for diagnosing horses’ ailments through her sense of touch. Soon she has fallen in love, but not with the man her father has chosen for her. Duty pulls Nicole and Philippe in different directions and Nicole becomes a wife, mother, then widow while immersing herself in the healing arts. When Anne of Brittany begs her to save her infant daughter, Nicole works alongside a physician from the South whose reputation for healing began with his work with horses. Will Nicole succeed in saving the Queen’s daughter? And if she does, will the Queen reward her with the greatest desire of her heart—marriage to the only man she has ever loved? 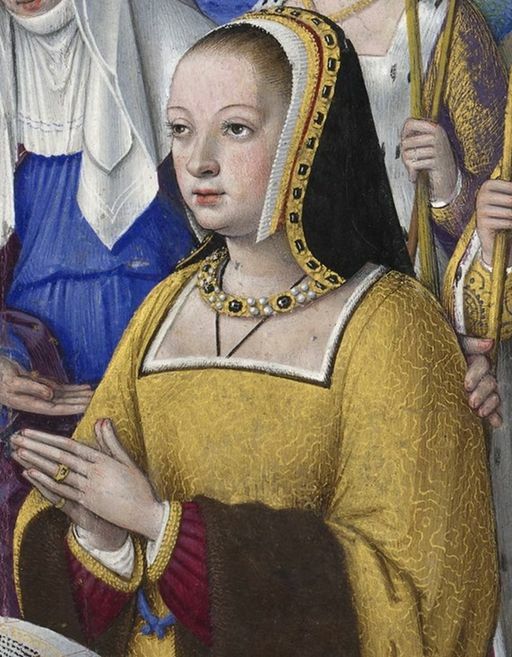 ANNE OF BRITTANY inherited the Duchy of Brittany at age eleven upon her father’s death in 1488. Three years later she married Charles VIII and became Queen consort of France. 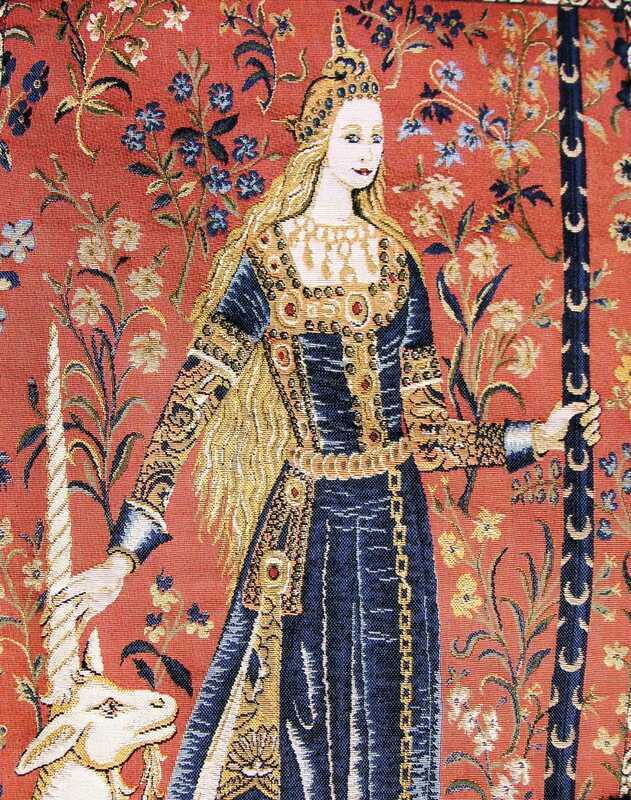 Instrumental in introducing new techniques of architecture and craftsmanship from Milan to France, Anne of Brittany ushered in the Italian Renaissance to France. By age twenty-one she had buried her husband and all four of her children. Within nine months she became wife of the new king, Louis XII. Pregnant fourteen times, seven times by either king, she raised two children to adulthood. Both were daughters. She is known as the first female ruler of France to bring together young women of noble birth at court, where she educated and trained them, then arranged appropriate marriage matches. A ruler of influence, refinement, and resources, she rose above personal loss with dignity and grace while espousing the cause of women’s advancement. Her story is for women everywhere. 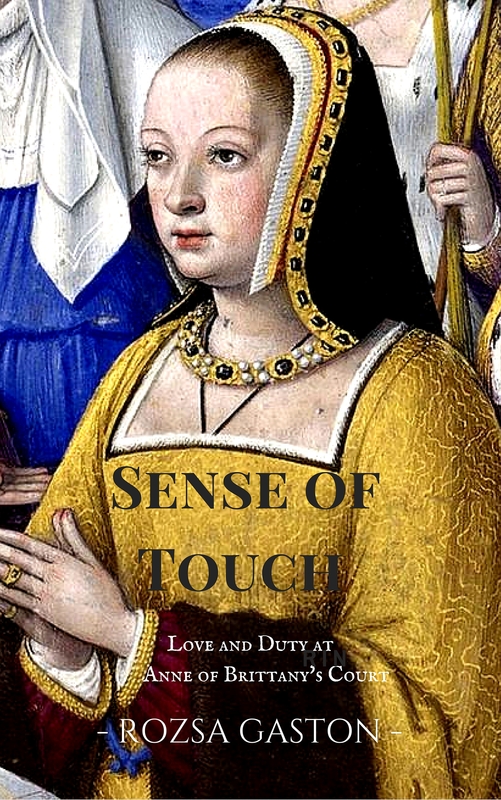 I would be delighted if you would click here to nominate Sense of Touch for publication. You’ll find an excerpt from Sense of Touch too. Enjoy and thank you.